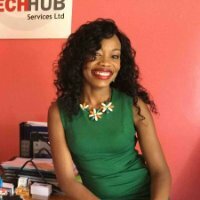 Making money in Kenya: Sylvia Moraa Mochabo is the chief executive officer of Tech Hub Holdings Limited, a company with three subsidiaries dealing in business development and consultancy, printing, branding and graphic design, and events management. Financial milestone: There was a time in 2015 when I spotted a chance to scale up. A more sophisticated digital printing equipment was coming into the market and I knew that was the right time to get in. Sadly, I didn’t have enough money to purchase it. I got a tender to supply some items that required the use of a high tech printing machine. I took this opportunity to apply for a loan from my bank. It was declined because the type of investment I wanted to make was not in their loans portfolio. I went to a different bank where I secured the loan and facilitated not only the purchase of the machine, but the growth of my overall business asset base. I learned that as women entrepreneurs, we need to relentlessly take chances in order to grow. There will always be that one person who is ready and willing to walk with you or support you even when others don’t see or share in your vision. Building wealth: Thorough planning, positive attraction and hard work are the secret. I always start from the end in all that I do by first understanding where I want to end up, then breaking down the journey to that destination with realistic timelines. Over time, I have learned that it is important to live within your means and learn the trends with aim of knowing what the next big thing is. Similarly, don’t invest just because everyone else is doing so. Be different; the road less walked always leads to greater things. Wealth vs riches: There’s a big difference between being rich and being wealthy. You can gain riches from employment as long as you scale your way up in your area of expertise and build up cash along the way. But from an entrepreneur’s eye, this is akin to selling your time to build another person’s wealth. It does not always equal success. Personally, I prefer wealth, which entails direct or indirect entrepreneurship. Biggest money mistake: I got a baptism of fire when I ventured into a distribution business I knew very little about in 2014. Being a marketer, I analyzed the opportunity and worked out the plan on paper. It looked super. I pitched it to my close friends and we launched. We ended up losing almost Sh. 2 million within 4 months. I tried to hold on and change tactic but distribution was just not my cup of tea. Had I continued pushing it, we would have lost a lot more and probably broken our friendship. Don’t hold on too tightly when the end result is inevitably set to be failure. Saving method: At first I tried to have a separate bank savings account. This form of saving didn’t work because I’d always find myself reaching into it whenever times got rough. Currently, apart from the insurance covers that I have taken for my kids and myself, I have a Sacco to which I contribute monthly. This works in tandem with one of my fixed deposit accounts. If I could start all over again: I’d be bolder in making shareholding demands in my partnership businesses. I’d also be very clear that my partner or partners share the business vision fully and know the terms of engagements and roles expected of them. Biggest loss: I have had clients who placed orders for items but never paid up. Over time, this may pile debts owed to suppliers. In fact, it is one of the reasons that led me to shut down my first company recently.